As the holidays approach, many of us will gather with family and friends. More often than not, these gatherings will include reminiscences about loved ones, re-telling of funny family stories, and the sharing of traditions honored year after year. This emphasis on remembrance, so welcomed during joyful times, can be quite difficult for those coping with loss. For family, friends and neighbors who are facing grief after the death of a loved one, the holidays may instead be a time filled with pain and sadness. And even for those for whom grief is not as fresh, the holidays may serve as an annual reminder of the loss—not only of that person, but of tradition and celebration. Many people may not be aware of the support hospice professionals offer to members of our community who are struggling with grief during the holiday season. 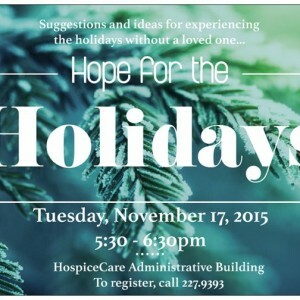 If you or someone you know may be struggling with issues related to loss, I encourage you to attend HospiceCare of the Piedmont’s “Hope for the Holidays” Workshop. It is open to the community. Please call our office and let us know that you plan to attend, 227.9393.